History says that in order for the monks in Greece to be safe from the increasing number of Turkish attacks they decided to climb up and hide at the top of the huge rock formation that is now called as Meteora. That was in the 11th-century era and back then one could only access the top by using removable ladders or windlass. Now just imagine how difficult it was to build those monasteries on top of that hilly rock sourcing out materials like rounded boulders just to build an establishment that withstands time. Seeing the place in photos already amazed me, what more if I could be able to visit and be there even for a moment. Continue reading will tell you more about my Kalambaka trip and on how to you could be able to reach the place the easiest way. The place only existed in my head just when we were researching about different activities to do in Greece. I was surprised when I’ve learned about Meteora. It actually made me realize Greece isn’t just about white and blue structures as we mostly see on photos. And when I read about the history, It already gave me that thought that I shouldn’t missed to visit this amazing structure. Located near the town of Kalambaka, Meteora is already such a sight that covers the whole panoramic view of the town. The name Meteora means “elevated” and is rooted in the word “meteor.” Currently, Meteora is included in the Unesco World Heritage List. While searching ‘How to’s‘ on how we could be able to reach the place, I realize that it would be a challenge commuting from Athens to Kalambaka area, and is also difficult for one to drove up to the mountain. Doing a DIY trip to Meteora would require us to either rent a car, or ride different transportation system just to reach the place. It could be tiring but would have been an adventure and expenses would vary depending on whichever mode of transportation we decided. 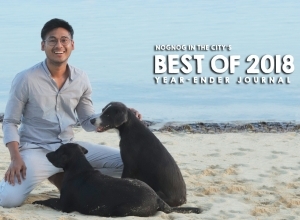 I consider traveling to be both of an adventure and relaxation thus if I could do it with less hassle and worries, I would definitely grab the opportunity. 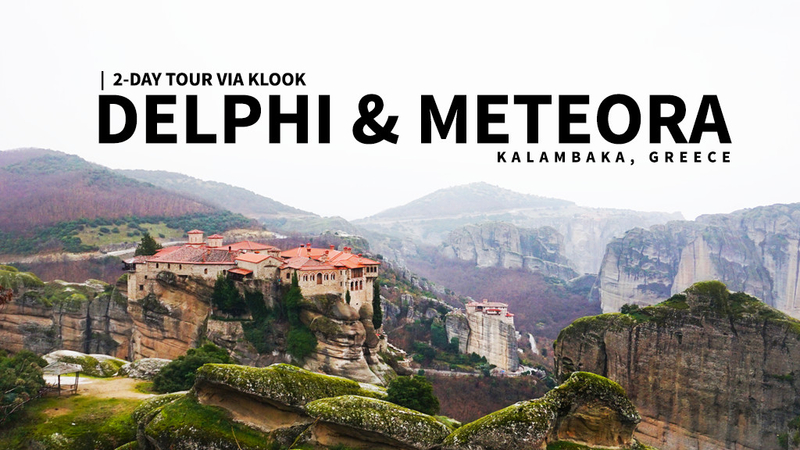 We decided to book a Delphi and Meteora 2-Day Tour from Athens via Klook. The 2-Day Tour of Delphi and Meteora via Klook cost us around Php 8,000.00, (as of my writing the tour is already at Php 8,559.00) I guess the price varies depending on the demand. The tour got two options, Tourist Class or First Class Hotel. Both require a minimum of 2 persons to book. You can save more if you are booking by two’s. 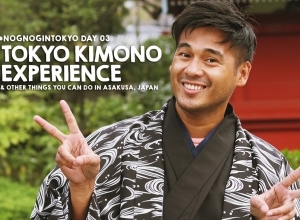 They also have a Solo Travellers package which is a bit more pricey. The tours can only be availed every Monday, Wednesdays, Thursdays, and Saturdays, so better aligned your schedule accordingly if you are getting the Klook services. Also, check the website once in a while for there are some months that the service isn’t available and/or schedules might change. First class hotel clients are housed at Divanni Kalambaka Hotel while the Tourist Class option is at Orfeas Hotel. We picked the latter after all we were just staying for a night. Both hotels are located at the foot of Meteora, in Kalambaka town is actually just across each other. As early as 6:30 am, we were already up and ready to transfer to Stratos Vassilikos (Our 2nd hotel in Athens; Read: Where to stay in Athens). A few days before the trip, I received an email telling us that the hotel pick-up will be at 7:30 am, we were also advised to be at the hotel lobby 15 minutes prior to the scheduled tour time. So as soon as we check-in at the hotel, we just left our luggage, pack a few things and went straight down to the hotel lobby. A few minutes after, the bus of Key Tours arrived. We were the first one to ride the bus, so we decided to be seated in front for a nicer view (Do check out my youtube videos will upload the full trip there: Youtube.com/NognoginthecityVlogs). Unfortunately, we were asked to transfer to another along with the others who availed the two-day tour (By the way Klook also offers a day-trip to Meteora, which I felt a bit tiring you’ll know the reason why in a bit). We were the last one to ride that bus, thus we decided to just be seated in the back seat. A Professional English tour guide was leading the whole pack. When everybody was already settled she started calling all the names that were included in the trip. This, of course, is to check if everyone was already on board. It was a variety of nationalities. Half of the tourist were Italians, there were also a handful of Japanese, Australians, Greeks, while Ruth and I were the only South-East Asians in the group. Maria, the tour guide, explains everything in English and translates it to Italian. It was a 2-hour drive from Athens to our first destination, Delphi. Before reaching the place, a stopover for toilet or coffee break was held. Located at upper central Greece, within the slope of Mount Parnassus, Delphi is just one of the places in Greece that have a phenomenal influence in the ancient world. The rich story of Delphi was actually relayed to us bit by bit by our tour guide but my lack of patience made me just want to stroll around the place. It was told that the name Delphi comes from two historical theory, one from a blue dolphin they called Delphina, the other theory was about two siblings (I wasn’t paying attention when this was being told). The people of ancient Delphi were Pagans and worship their god Apollo. We were also told that Delphi sits at the navel (or center) of the world, which is represented by the stone monument known as the Omphalos of Delphi. Delphi is also recognized by UNESCO as a World Heritage Site. After our 45-minute stroll in Delphi, we went to a nearby restaurant in town to have our late lunch. The passenger of our bus was the only customer at that time. We had pork chop and scrambled eggs and is priced at 21.80 Euro in total. I wasn’t really happy with my food choices here. We finished our lunch around 2 pm and pass by the place they called Thermopylae. It was where the famous Battle of Thermopylae was fought between King Leonidas of Sparta and the Persian Empire of Xerxes over the course of 3 days. The place now maybe was just an open ground with the monument that represents the 300 Spartans, 700 Thespians, and 400 Thebans, who battled millions of people in this place, but it also made me realize that this legend was really true! Around 4:30 pm, we are already on our way to Kalambaka. Our tour guide, Maria, was explaining about Meteora and on how it came to its name rooted from “Meteor.” They describe the place to be a compilation of hanging rocks between earth and sky, hence Meteora. Aside from that, she also talked about the religious significance of the place pointing out that Delphi is Pagan while Meteora is about Christianity. Have I mentioned that almost 98% of Greeks were Christian Orthodox. At 5:25 it was already 8 degrees outside. The bus went to this huge food place for our 20-minute break. In total, Athens is 400km to Kalambaka and at around 7:30 we finally arrived at this town. Nine of our bus-mates are booked at Divina hotel (first class hotel), while the remaining (15) stayed at Orfeas Hotel, which is actually located just in front of the other. The hotel was decent enough for a provincial hotel. It was kind of old but still got that unique vibe especially if you are looking outside. One of the best things that excite me during travels is when you started to connect and get to know the other travelers. We were able to do that when we had our dinner. Ruth and I decided to seat along with others. On our table was Carolina from Chile, Yuko from Japan and another guy (who I forgot the name) from Spain. Over dinner, we had conversations about our travels, the countries we live in as well as our excitement on the next adventure. After dinner, Ruth and I decided to stroll around the city center. The whole stretch was full of restaurants and shops, like the pub street in Cambodia, but here is a bit different, with fewer people and is much chill. Near the center, we finally found the coffee shop (Mikel) we’ve been looking for in Athens right after Niko brought it up to us. We got an early call time on the next day. After breakfast, we pack, paid the hotel fee (tax), and ride the bus again. We are on our way to Meteora. For today we will be visiting 2 of the remaining 6 monasteries (3 male, 3 female) in Kalambaka. A monastery is either housing monks or nuns and currently only a few of them live in this place. From the original 24 monasteries, only 6 of which currently remains operational. The others were either attacked, abandoned or left behind over the years. The Monastery of Great Meteoron is the largest and the oldest of the monasteries located at Meteora, though in 2015 there were only 3 monks in residence. “Suspended in the air” (meteoro), as the people calls it because of the formation of the gigantic rock on top of which the monastery was built. It was difficult climbing up, add to that the very cold and bad weather (it was raining when we arrived). But I guess we were lucky enough stairs was already created (Remember I mentioned about the used or removable ladders). I think it took me around 12-15 minutes just to reach the top. To get inside, tickets can be purchased for 3 Euros. But if you are on tours just like the Klook tours we availed, tickets are already inclusive in the package. Did you know that before women were prohibited to enter this monastery? Not until an incident happen in 1960’s where one of the part of the place was caught on fire and the ladies of Kalambaka helped. Since then, little by little, the ladies were accepted at the place. The Monastery of Great Meteoron are comprise of a Cathedral, Museum, Old Kitchen and even a grave were monks bones are displayed. Our tour guide also said that if someone wants to be a monk, he should be 18 years old or up, studied religion, pass the preparation test for 3 years, have a second baptismal and then he will be given a new name. These monks usually wears blue at first and eventually wears black after the 2nd baptismal. I haven’t seen a monk on our tour, probably they were so few and the place was so huge for them to be sighted. But Maria continued on explaining that a Christian Orthodox Monk is different from the Monks in Tibet; Orthodox monks wears a black skirt, a black hat and have a long beard and hair. Monastery of St. Stephen is much accessible compare to the first. Here it didn’t require us to climb up much stairs for the place was already connected to the road. St. Stephen’s monastery is actually ideal for people who cannot use the steps but still want to have that monastery experience. It was a small monastery and is actually considered as one of the newest for it was only born during the second world war. As of the moment, we were told that there were approximately 40 nuns living in this place. What I love about St. Stephen Monastery is the cliff view at the end. You could have a sight of the town covered with reddish roof protruding against the grey land here. It was intensely cold when we arrived at the place. I remember the weather reach to 4 degrees Celsius. After the tour, the bus went straight to this souvenir shop called Icons. Items and memorabilia from the trip can be purchased. They also show us here how the images were created through wood craftsmanship. On our way back to Athens we pass by the restaurants we had on the first day, (where we had lunch) and the coffee shop (where we had our toilet break). It was a great experience after all. The place amazed me specially realizing how each monastery were built by a few people with just a few resources. Also, the difficulty of living on those era, going away from the war and adapting to this kind of environment. I guess they were warriors, for most of the photos hanged in the wall were images of their fights against Nazi’s, just like how the Philippines was colonized by the Spaniards, where religion sits side by side with the conquerers. I also realize that if we haven’t booked this via Klook, our travel to this place could have been very difficult (or wound’t even happen). Also, doing a day tour to Meteora would be a bit tiring I supposed considering its distance from Athens. That is why, spending around Php 8,000 for a two-day tour to Delphi and Meteora is definitely worth it. 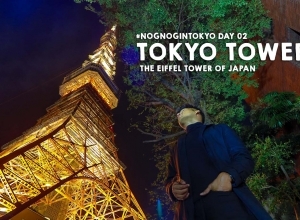 Tokyo Tower – The Eiffel Tower of Japan; Is it Worth to Climb?